Summer and autumn are gorgeous seasons for outdoor activities. Camping and visiting national parks are some of the most popular. Who doesn’t love spending time in the great outdoors? While you’re soaking up the sun and enjoying time with the family it’s important to remember that you’re a guest in nature. Be sure to exercise caution and avoid wild animals! Recent media reports of wildlife attacking humans have many people concerned and reconsidering their time spent outdoors. Utah wildlife species that have been implicated in attacks on humans, livestock and pets include black bears, mountain lions, moose, elk, mule deer, coyotes, raccoons, turkeys, rattlesnakes and bison. Negative interactions with large ungulates are becoming more common place as humans are increasingly recreating in animal territory, and it’s important to not let human curiosity overrule common sense. Recent altercations in Yellowstone National Park attest to the value of common sense over curiosity. In June, a bison gored a woman in the Lower Geyser Basin. Before the attack, the woman and other people were within 10 yards of the animal as it crossed a boardwalk. The animal became agitated and charged. Also in June, and in the same area, two women were attacked by a cow elk when they got between the cow and her calf; the cow was defending her calf. Since 1980, Yellowstone National Park has had over 100 million visitors. During this time, 38 people were injured by grizzly bears in the park. Though this is more than anyone wants, according to the Park for all park visitors combined, the chances of being injured by a grizzly bear are 1 in 2.7 million. For Park visitors who remain in developed areas, roadsides and boardwalks, the risk decreases to 1 in 25.1 million. For those who camp and travel in the backcountry, the risk increases to 1 in 1.4 million for those who stay overnight and 1 in 232,000 for those who travel in the back county. Although there will always be risks, they can be managed by using common sense and following simple rules. First and foremost, always remember that Utah is wildlife country. It is home to an abundance of wildlife, which is why so many people are drawn to our state. Should you encounter wildlife while hiking, biking or camping, remember that distance is your best friend. Most of the attacks reported occur because someone wanted to get that once-in-a-lifetime selfie. Always give the animal a clear path to escape. If you do encounter wildlife, stay calm and do not run. Pick up children or pets with you. This is the one time that you can be as obnoxious as possible outdoors. Puff up you chest, shout and stomp your feet. Back away slowly. And again remember, do not run! If a moose, elk or deer knocks you down, curl up in a ball, protect you head and lie still until the animal moves away. If attacked by a large predator, fight back! If you encounter a rattlesnake, stop, listen to locate where the rattle is coming from and back away to allow the snake to escape. Keep a clean, odor-free campsite by storing food, drinks and scented items securely in wildlife-proof containers at least 100 yards from your tent. Keep trash away from your campsite, and do not burn it in your fire pit. Clean your tables, stoves and grills to remove food or odors that could attract wildlife. Keep your pets leashed in camp and stay with them on the designated trails. Do not let your pet chase or “play” with wildlife, as your pet may be viewed as food. Always hike, jog and camp with companions. If you find a wildlife carcass, stay away from it. You could be perceived as messing with a predator’s food, which could cause them to become aggressive. 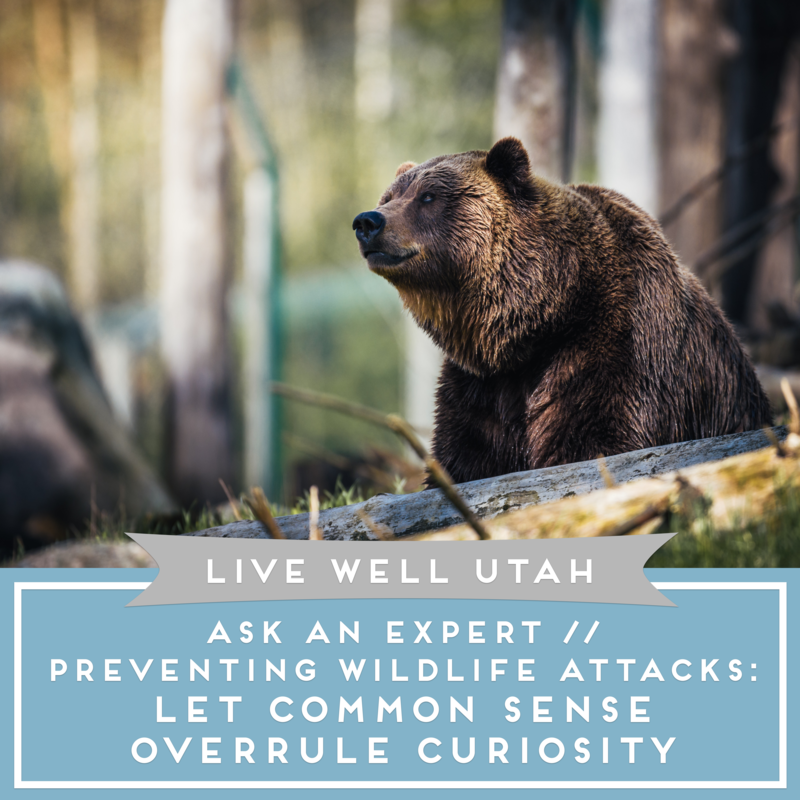 If you have an encounter with aggressive wildlife, alert the Utah Division of Wildlife Resources office nearest you. For further information on wild animal attacks, visit wildawareutah.org. This article was contributed by Terry Messmer, Utah State University Extension wildlife specialist.